Curb My Clutter picks up clothing and electronics for recycling when residents text or call with items they want to get rid of. Aging computers, televisions, and other electronic devices often have one thing in common. “They’re really hard to get rid of," said Steve McNelis, director of the Radnor Township Public Works Department. Radnor, Main Line neighbor Tredyffrin Township, and other towns have occasional e-waste drop-off events, but the lines are long, and people complain. But this year, Radnor and Tredyffrin have joined eight other municipalities in offering residents another option: They can text a local company to pick up their stuff at their door. 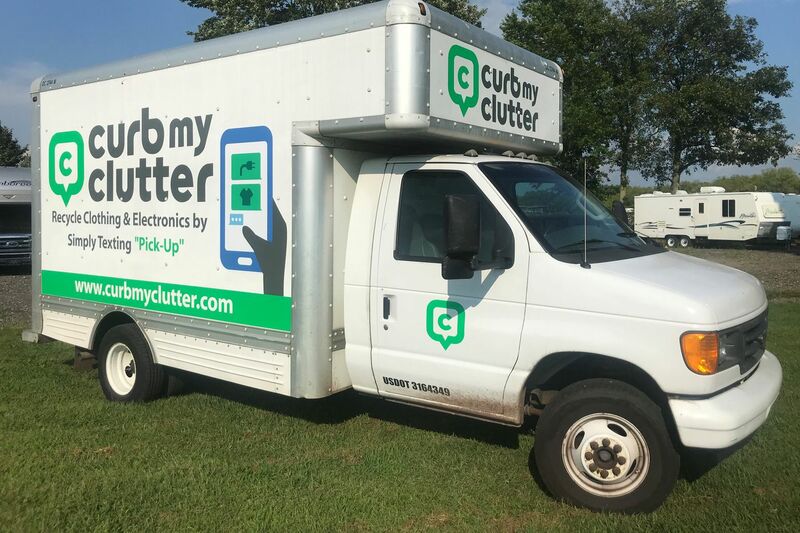 Curb My Clutter, a for-profit company based in Souderton Borough, Montgomery County, picks up both electronics and clothing to sell to third parties for reuse or recycling. “I think most people in America want to do the right thing" by keeping usable items out of landfills, said Bob Anderson, the company’s vice president of business development, but “a lot of people just don’t have a means” for moving their stuff. Residents get the convenience of scheduling pickups at their homes, and municipalities say they save time and money. Communities in the area typically spend $50 to $85 per ton on landfill fees, said Anderson, a member of Philadelphia’s Solid Waste and Recycling Advisory Committee who has worked in the industry for three decades. So reducing waste reduces total fees. Cutting waste also helps communities in Pennsylvania and New Jersey qualify for state environmental grants. Municipalities do not pay for Curb My Clutter, which collects most items for free, the exception being the fees it charges for televisions — $35 for newer, flat-screen televisions or $100 for older, bulkier ones. The company does not charge for picking up other electronics, such as stereo equipment, gaming consoles, and computers. It collects shoes, Halloween costumes, and jackets; bedding, such as comforters, sheets, and blankets; and household items, such as curtains, towels, and tablecloths. Curb My Clutter targets clothes headed not to Goodwill or a local thrift shop but to the dumpster. Roughly 10.5 million tons of textiles went to landfills through municipal waste in 2015, according to the most recent U.S. Environmental Protection Agency data. But clothing can fetch $400 to $700 per ton if recycled for domestic or internationaluse , Anderson said. “You have all this significant value that’s just going in the landfill,” he said. In addition to Radnor and Tredyffrin, Curb My Clutter makes local pickups in Swedesboro Borough and Woolwich Township, Gloucester County; Gloucester and Pine Hill Townships, Camden County; and Springfield and Lower Merion Townships, Montgomery County. The company also operates in Bethlehem, Pa., and in Westfield, in North Jersey. The company is in talks with several other Philadelphia-area communities and expects to add hundreds of thousands of households in the next few months, Anderson said. Philadelphia plans to bring back bulk trash pickups at residents’ curbs, a service the city discontinued in 2008 to save money. But some towns and cities, including Woolwich, would rather cede responsibility for disposing of electronics to Curb My Clutter. Nearly 200 residents in Woolwich, which became the first community to partner with Curb My Clutter in February 2018, have gotten rid of roughly 6,640 pounds of clothing and 13,900 pounds of electronics, according to the company. Since Tredyffrin began its pilot program with the company in January, 15 residents have set out nearly 140 pounds of clothing and about 750 pounds of electronics. Since last summer, Curb My Clutter has picked up 3,060 pounds of clothing from Gloucester Township residents. Gloucester picks up residents’ bulk trash but not clothes. “We encourage our residents to recycle as much as they can and now we’re providing the ability to recycle clothing,” said Mayor David Mayer, adding that the service fits into the township’s sustainability goals. Although the township teams up with counterparts in Camden County to reduce the cost of trash disposal, Mayer said landfill fees rise every year. Gloucester pays $60.50 per ton.